Whenever I think of a musician who’s mixed the love and practice of both art and music, it’s David Bowie. He certainly had a hand in inspiring artists himself, whether via his ever-changing personae or the imagery of his music. Or, as you’ll see here, works of art themselves. The wonderful Bowie mural you see pictured above in Brixton in south London is by Australian street artist James Cochrane. This is where fans gathered after Bowie’s death in 2016, just a few days after his birthday. 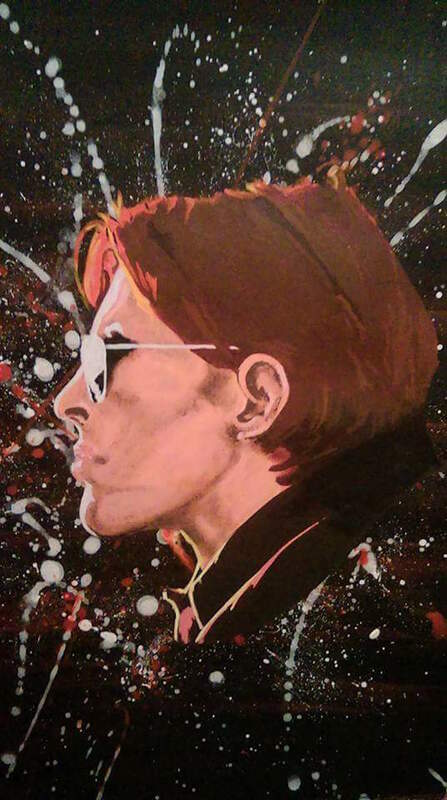 And seeing as today would’ve been his 71st birthday, here’s some brilliant work at a Bowie-themed exhibition here in Glasgow later that same year, 2016. My favourite ones are the monochrome chameleon which is by Glasgow artist Rebecca Scott and the Bowie profile which is by my other half Stephen Scott. Needless to say I loved Bowie’s Ziggy Stardust and Aladdin Sane days and beyond. Later on my tastes led me to punk and metal bands, including Hawkwind which was a bit of both. Hawkwind are great to paint to with their synth sounds, guitar feedback and spacey vocals. Their music makes you feel like you’re on a spaceship zipping past the Orion Nebula or gazing out of a porthole at the Ring Nebula in Lyra (well they do have an album called In Search of Space!). Moreover, their music reminds me of being at summer festivals far from the city, seeing rarely visible stars – and being young again! I pilfered a couple of their song titles for my paintings; it’s entertaining to see searches for Hawkwind-related gifts on Etsy finding my paintings! The blue one Space Ritual and friends have compared it to marks made by champagne glasses on a table and marks in the sand after the tide. And, best of all, sextants with compasses, and the idea of using the stars to guide direction. Orgone Accumulator is a large green-gold textured number. As I was creating the work I was thinking about atoms and electrical charges as well as listening to the song itself. Furthermore, it was picked by the Guardian’s Share Your Art section as one of its paintings of the month when they did a science-themed month. 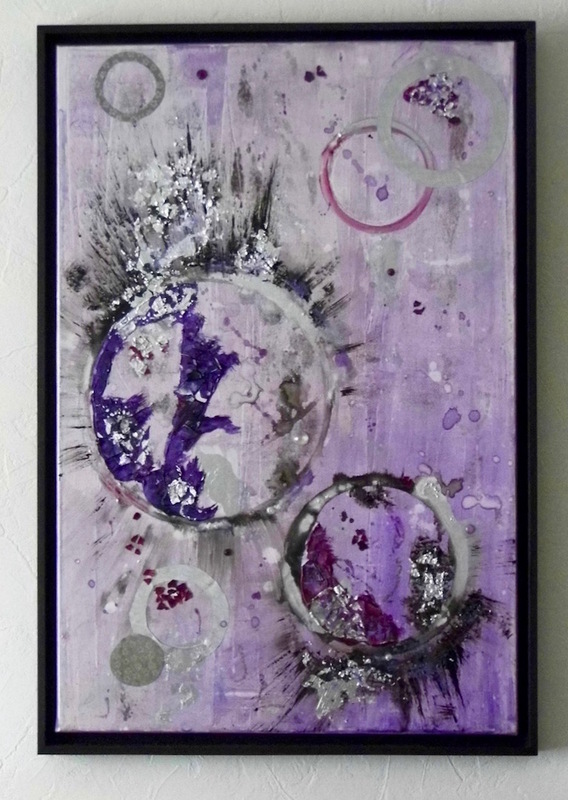 Another of my favourite paintings is Purple Haze, named after the Jimi Hendrix Experience song naturally. 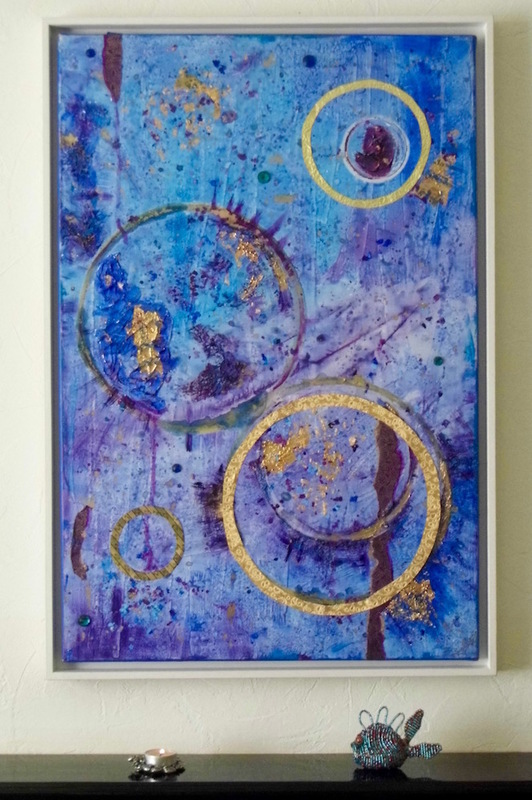 I created this piece to be soothing and meditative rather lively like the song itself. It makes me think of thought bubbles and inspiration. Additionally, in colour therapy purple has a calming effect on the nerves apparently. By the way, feel free to comment if you know what an orgone accumulator is!). 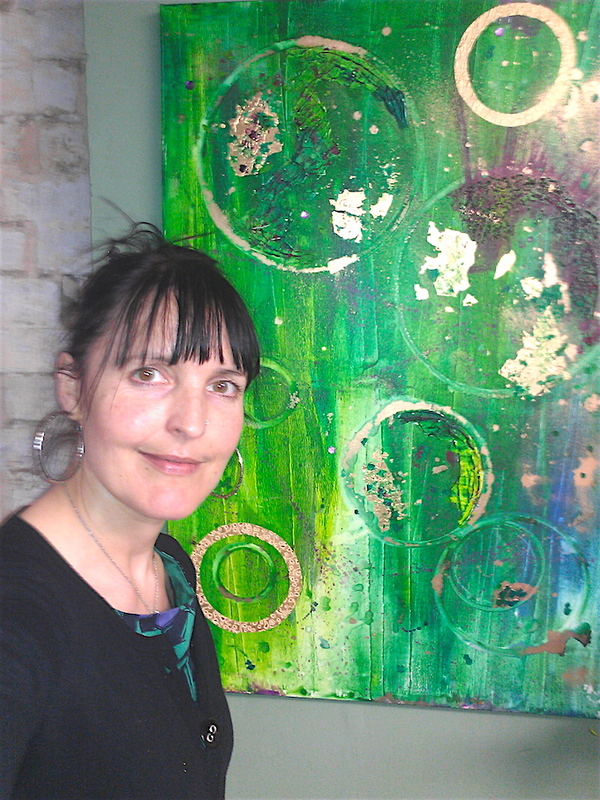 Meanwhile, another artist who is also inspired by music is London artist Julia Everett. 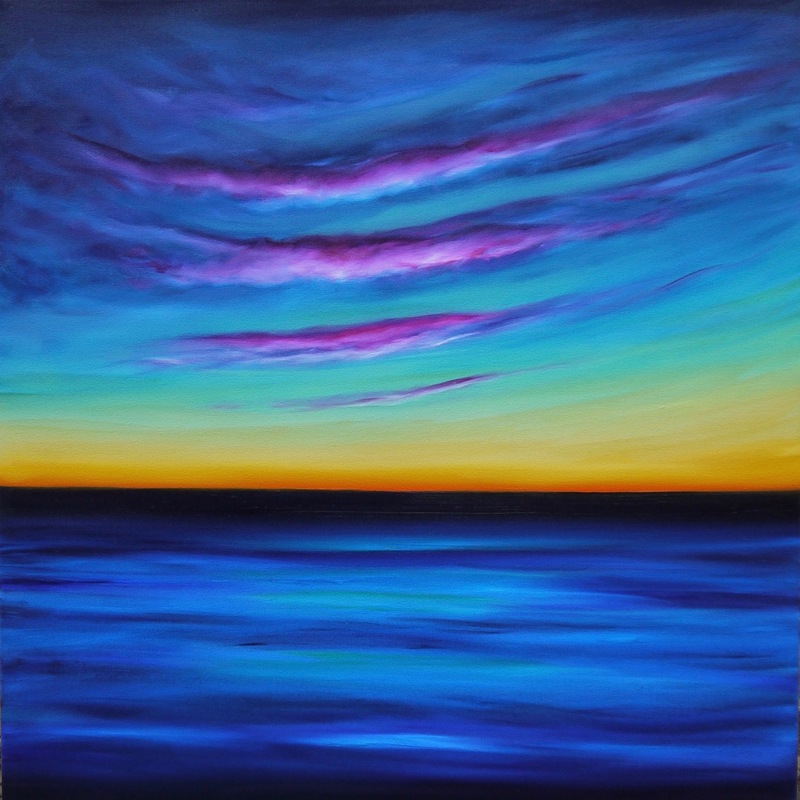 Julia creates jewel-like seascapes in oils that positively glow. And she uses lyrics by her favourite artists and bands for her titles as a matter of course. This stunning work is called After Today and measures 80 x 80cm. 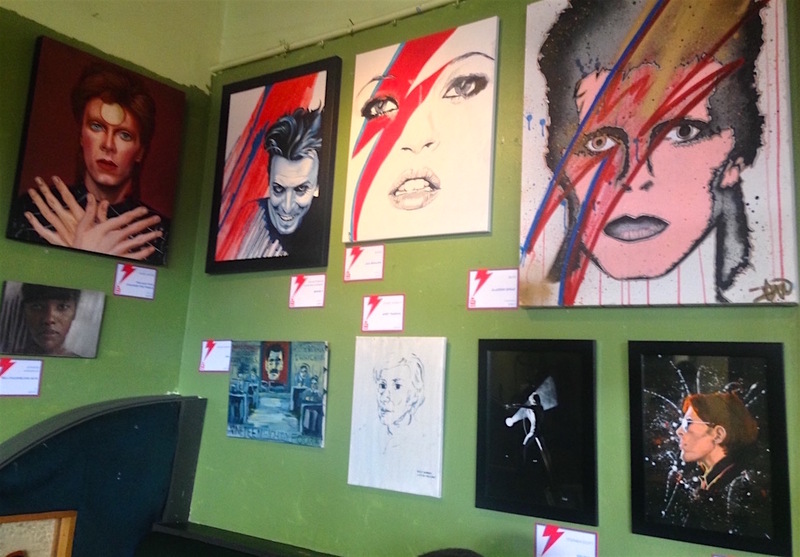 It’s one of Julia’s Bowie series created in tribute to her favourite artist and is a fitting way to end this post. I hope she’ll be happy to be one of my artists of the month in the near future when I can write about her work with more detail and description. Music being as important to me as it is, I have the feeling that this won’t be the last time that I blog about how music has helped the creative process. Oh, and happy birthday David Bowie 🙂 . Do you like listening to music when you’re being creative? Who do you listen to? What do you listen to if you do? *Check out my website www.emerald-dunne-art.co.uk to see more of my work (still a work-in-progress).